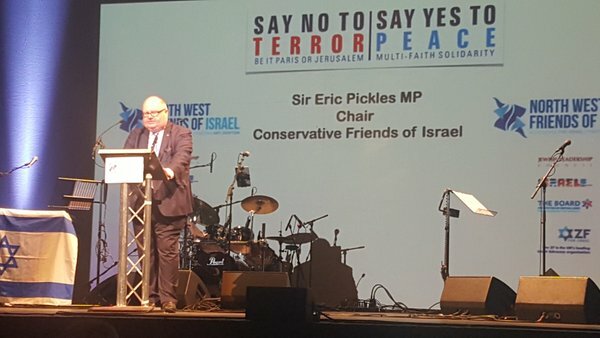 Senior politicians joined Israeli diplomats and Jewish community leaders alongside more than 1,000 Israel supporters in Manchester on Sunday, as the major event passed without incident despite protests. Organisers at North-West Friends of Israel (NWFOI) said activists behind the Boycott, Divestment and Sanctions (BDS) campaign had tried and failed to have the city centre rally cancelled. 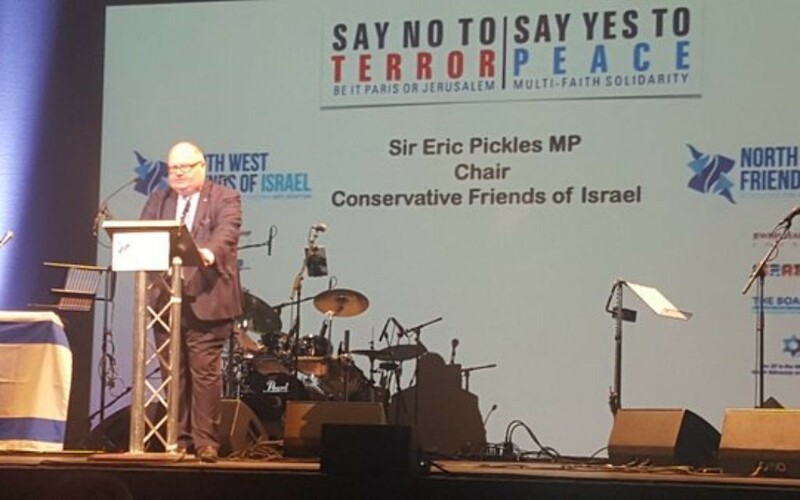 Police reported no arrests, as the crowd heard from former cabinet minister Sir Eric Pickles and Deputy Israeli ambassador Eitan Na’eh, who urged the community to support more grassroots groups. Na’eh said Manchester was the birthplace of Chaim Weitzman, Israel’s first president, and spoke of the debate about Jew-hatred dressed up as anti-Zionism. “When you say ‘Zionists’ you mean Jews, so you are talking anti-Semitism,” he said. Outside the Palace Theatre venue, where up to 100 pro-Palestinian protesters read out the names of Palestinians killed by Israeli forces, a Manchester Palestine Solidarity campaigner said: “A committed Zionist is a racist.” In response, a NWFOI spokesperson called the pro-Palestinian protesters “pathetic racists”. He added, that next year when the UK Jewish community will mark 100 years since the signing of the Balfour declaration, the “Board of Deputies looks forward to celebrating”. The event involved several Christian leaders, including Archbishop Doye Agama of the Pentecostal Movement, David Parsons of the International Christian Embassy and Pastor Mike Fryer of Christians for Zion.